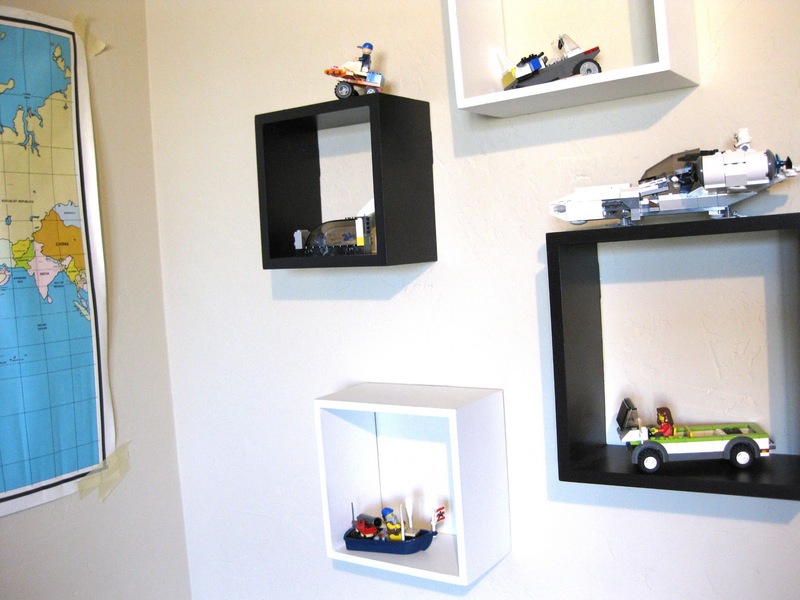 Here is the finished boys room. Ok, not really finished, what room ever really is, right? It will constantly evolve as I find new items to add to it but I'm satisfied with how it currently looks, and I'd like to finally mark it off my to-do list! 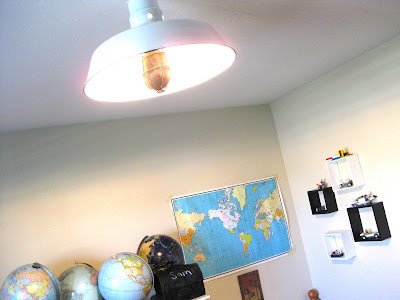 My two boys share this small room which I've stuffed full of cool finds. Almost everything in this room was found at the thrift store with the exception of a few items, including the beds and dresser that we've had for years. I wanted the main focus to be the maps and globes that I've been collecting over the last few months. 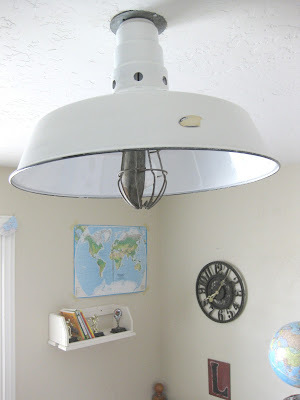 An old industrial barn light found for $6 at the thrift store, combined with a $3 vintage cage light becomes the star of the room. I added numbers to this dresser to copy one I'd seen in an Anthropologies catalog. See how I did it here. Square cubes shelves also found thrifting hold one son's lego creations. A map bunting made from a vintage atlas found at the thrift store. You can purchase one in my etsy shop here. 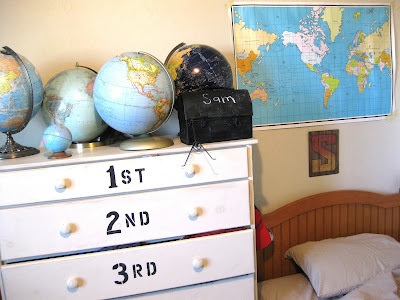 Lots of globes, a vintage lunch box (sprayed in chalkboard paint), and tin letter signs found at Hobby Lobby. 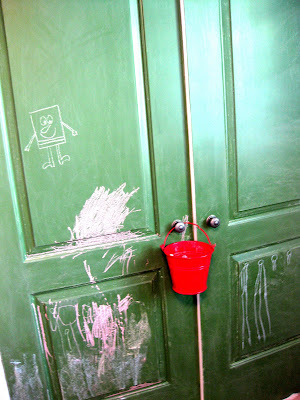 I painted the closet doors with a green chalkboard paint, and hung a red bucket perfect for holding chalk. With such a small room, organization is key. 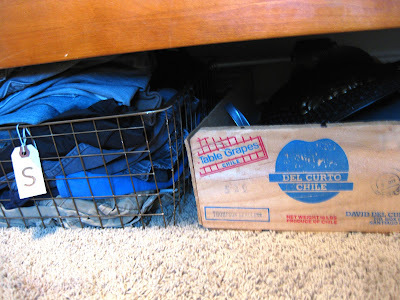 Metal baskets and old crates are tucked under the bed to hold off-season clothes and other stuff. I found this vintage school desk for $8 and a cute old lamp for $2 also at the thrift store. I almost didn't buy the desk because I knew it would be cramped in the space, but it was just too cute to pass up. The boys actually sleep with their heads on the opposite side because my husband read that the electrical box, which is just outside this wall, would interefere with their sleeping patterns. I also have a thing about hanging things above heads where people are sleeping, so no worries they are safe. It's so nice to finally get a project done that has been going on for months. It feels even better to know I found all this cool stuff at the thrift store for cheap. I look forward to my thrift store trip every week. It's always like a treasure hunt, and you never know what you are going to find. If you've never been, go try it! it looks awesome, michele! i especially love the touch the light adds- it's perfect for that room! Wow! I mean really WOW! 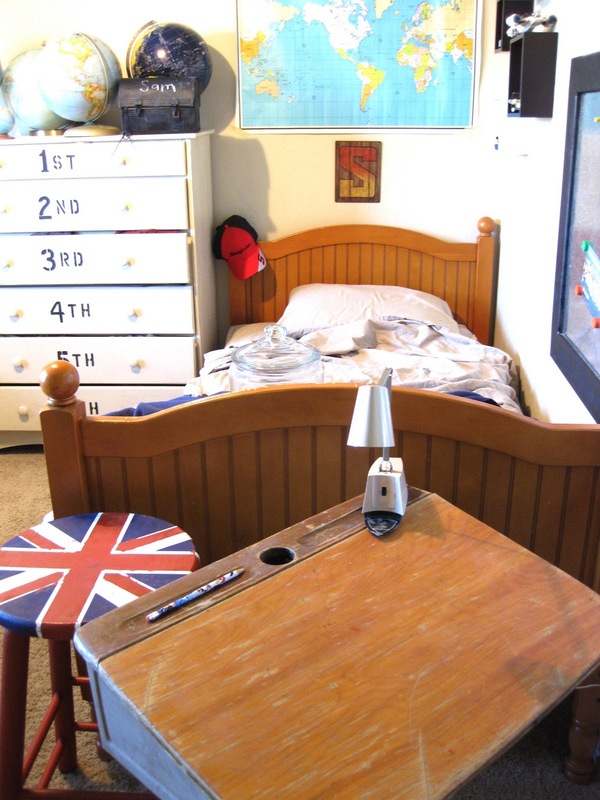 My Sam would love your Sam's room. I can't believe almost everything is from a thrift store! 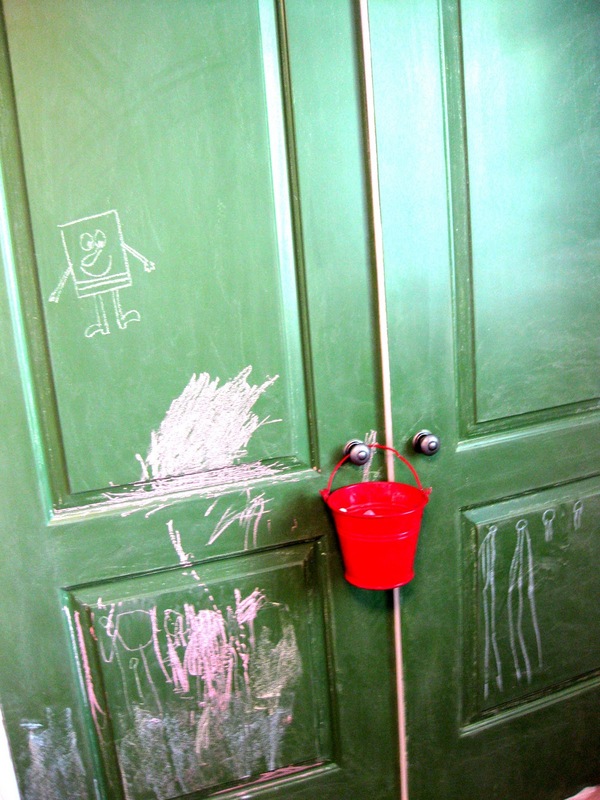 You've done an awesome job, the boys room is fabulous! 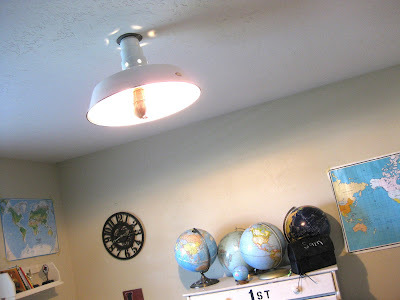 I loved the use of maps & globes plus that light fixture and the chalk door!! Love the globes and maps! What an adorable room! 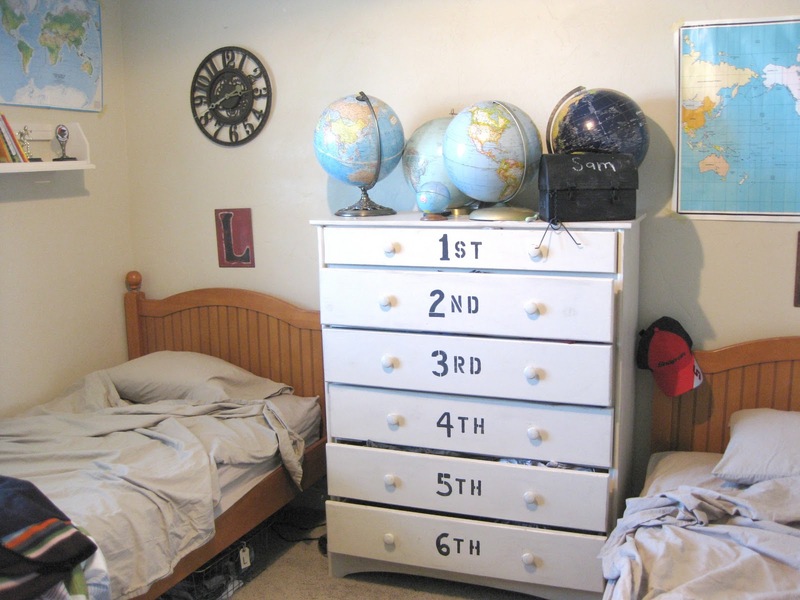 Love it--boys rooms are harder for me to decorate and I love the globes. Thanks for sharing! 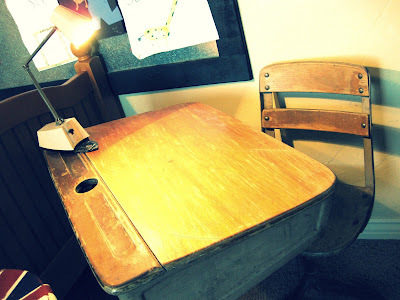 The room is awesome..I love the old school desk..
What a cool room! I love maps :) I have been on a hunt for a desk like that one...so cute! Wow. What a great room. I love the globes. I need to find some! I am such a sucker for any anthro inspired dresser. Looks great! Thank you so much for sharing.